Light up your landscape with no-fuss plants that offer brilliant red berries. The beauty of winter lies in stark contrasts, with bare limbs silhouetted against cool blue skies. Add colorful winter berries to your yard, and magnify these spectacular contrasts. A cotoneaster creeping over a railing and a pyracantha flattened to a wall inject vibrant berries into an otherwise naked world. But their beauty doesn't end there. Jane Bath, landscape designer from Land Arts in Monroe, Georgia, knows firsthand the value of these plants. "Using shrubs such as cotoneaster and pyracantha is the simplest way to get color into a winter landscape," says Jane. "They require minimal care and aren't plagued by disease." Because these shrubs adapt to poor soils and can handle heat and cold, they really won't cause too many problems. 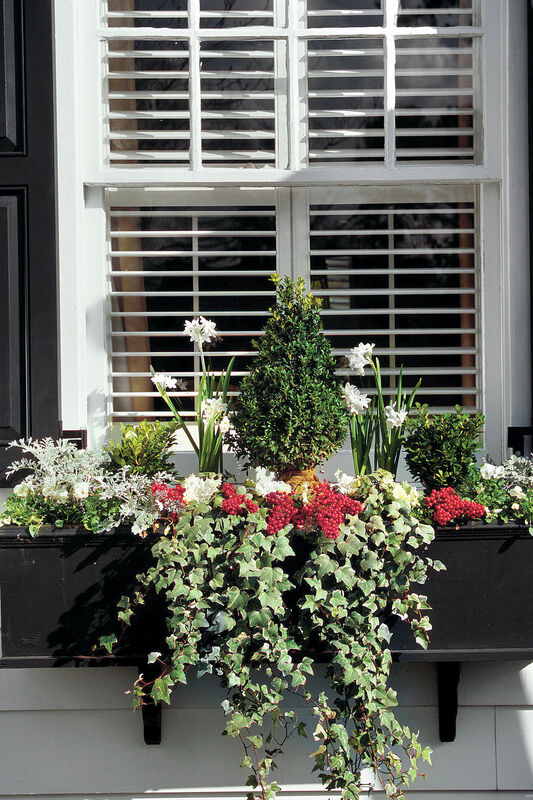 The biggest mistake most homeowners make, Jane notices, is fussing with the plants too much. "Just plant 'em, and let 'em go," she advises. With so many winter berries to select from, it might seem daunting to find the one that's best for you. But just match your conditions with the right plant, and you can't go wrong. One of Jane's favorites is brightbead cotoneaster (Cotoneaster lacteus), sometimes called red clusterberry. "Its evergreen foliage shimmers with a bluish green, and the limbs arch skyward. It's just incredible," she says. Or try rock cotoneaster (C. horizontalis) if you need a low-growing, tough plant that adds lots of showy red fruit all winter. For even more color options, look for pyracanthas, which are available with red, orange, or yellow berries. Buy them in winter when the berries are ripe if getting a certain color is important to you. Tall, short, or prostrate forms are available. Try 'Mohave' (orange-red) for a tall, disease-resistant selection (12 feet tall and wide) or 'Apache' (red) for something shorter (5 feet tall and 6 feet wide). For a low-growing selection, consider 'Red Elf' (red) or 'Ruby Mound' (red). Both reach only 2 to 3 feet tall but can sprawl to 5 to 6 feet wide. They also offer some resistance to scab and fireblight. While adding attractive, easy-to-grow plants to your landscape may make you very happy, you won't be alone. The legions of birds searching the bare winter ground for a meal will instantly become your biggest fans. Jane adds, "Putting in a cotoneaster or pyracantha is like setting up a cafeteria for the birds." Don't be surprised to see purple finches, cardinals, and even pileated woodpeckers dropping by for a bite. But you probably won't see deer. They don't typically browse pyracantha and cotoneaster, leaving all that beauty for just you and the birds. "Winter Ruby Red Berries" is from the December 2005 issue of Southern Living.